Are You Immersed In Your Hobby? While this picture is not related to any of the hobbies that we carry at Mark Twain Hobby Center, I am using it to ask you “Are You Immersed In Your Hobby”? This fellow certainly is. This is a group of World War 1 soldiers in France obviously taking some needed rest. 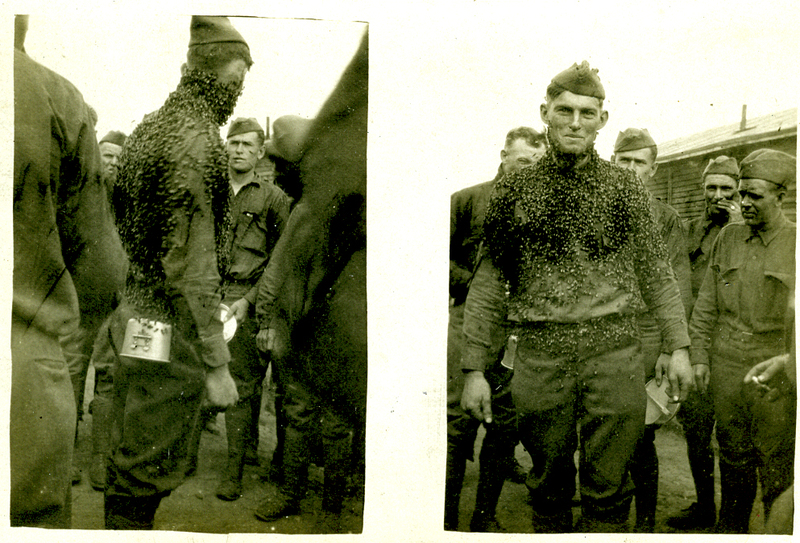 The “Bee Suit” that the one soldier is wearing is actually a swarm of honey bees. To do this he took the queen from the swarm and placed her on his clothing up around his neck. When the rest of the swarm located her they lit onto his clothing and neck and hung out forming the “Bee Suit”. Obiously, this soldier had the hobby of beekeeping back in the states and was used to being around the bees as he is very comfortable with them. Do you take the time to show people your hobby, or spend time telling others about the neat things that you do? Do you get really excited about the things that you do or build and want to share it with others? I certainly do and think that if you were to put out a survey it would show that those that enjoy their hobby the most are the same ones that share their excitement and joy with others about that hobby. Clubs are a great place to find others that have the same hobby interest and passion as you. How about sharing with others through such outlets as nursing/adult day care centers or at the library or in the schools? Over the years that we have been in business, we have put different groups in touch with hobbyists that would go out and spend a little time with others sharing their interest and passion. One such event dealt with older men in an assisted living facility that enjoyed building balsa stick models. Dan McEntee spent time with them talking about the models and showing what was available and tips on building these models. The feedback from the facility was phenomenal as each person shared their memories of building models as a kid. Or about the times that were spent with Cub Scouts giving tips on building better Pinewood Derby cars. Check with your church or local community center to find out the possibility of setting up a beginning model building class or take a youngster out to the field the next time you fly. You will be surprised at the effect that your enthusiasm will have on them. Take a look at the soldiers that surround this bee hobbyist. Want to bet some of them will go back to states and set up a bee hive.